High atop the Tibetan Plateau lies the remote mythic kingdom of Mustang, sacred ancient birthplace of Tibetan Buddhism. Culturally geographically, and historically Tibetan, but within the borders of Nepal, it presents a time capsule of Tibetan heritage and a place where the rich tradition of Tibetan Buddhism has been carried on to this day. Sumptuously muraled sacred temples dominate the capital city of Lo Möntang. The monumental 14th century temples lying at its heart have been the site of two decades of painstaking restorations of what are recognized as the most magnificent Tantric wall paintings ever uncovered in the Tibetan world. The amount of restoration work served another inspiring purpose: training the local Lobas to restore their own treasures. Over the past twenty years, lead restorer Luigi Fieni, has mentored native trainees in modern western techniques. As they were instructed in the art and science of conservation, the sacred temples of Mustang were slowly and steadily reborn. An enlightened preservation ethic unique to Mustang, including full completion of some damaged and lost mural sections, has allowed for truly distinctive Tibetan Buddhism traditions to continue untrammeled. Painstaking restoration of their places of worship has contributed to the revitalization of their culture and heritage, hopefully for many years to come. TIBETAN MUSTANG: Preserving the Past, Protecting the Future with contributions by such luminaries as HH Sakya Trizin (head of the Tibetan Buddhism Sakya lineage and spiritual leader of Mustang), Luigi Fieni, award-winning photographer and lead conservator of restoration projects in the Himalayan region, Kenneth Parker, PhD renowned large format landscape photographer, and Amy Heller, PhD, distinguished Tibetologist and art historian. The Crossing reveals, in photographs and prose, Roth’s search for identity and sense of place, a universal journey away from the known. Her poetic color photographs draw on the visual language of metaphor and explore the relationship between the internal and the external world. 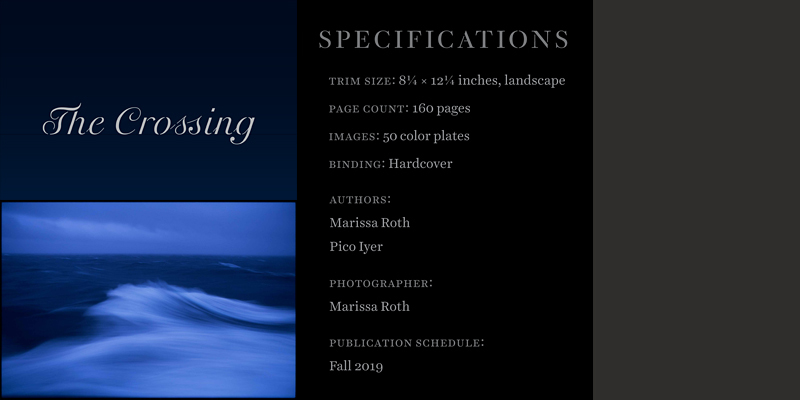 Marissa Roth is an award-winning photographer and the author of Infinite Light: A Photographic Meditation on Tibet and Burning Heart: A Portrait of the Philippines, among others. Pico Iyer is an author and spiritual travel writer, his titles include The Art Of Stillness and The Open Road (a meditation on his decades of travels with HH the Dalai Lama).